Mune: Guardian of the Moon (French: Mune, le gardien de la lune) is a 2014 French 3D computer-animated adventure fantasy film directed by Benoît Philippon and Alexandre Heboyan and written by Jérôme Fansten and Benoît Philippon. Set it an imaginary world, this poetic tale tells the adventure of a small creature who must recover the Sun that was stolen by his fault. The film was made in computer graphics and 3D stereoscopy, and features the voices of Michael Gregorio, Omar Sy and Izïa Higelin. The film premiered at Forum des images on 6 December 2014 and was theatrically released in France on 14 October 2015. "When a faun named Mune becomes the Guardian of the Moon, little did he had unprepared experience with the Moon, and an accident that could put both the Moon and the Sun in danger, including a corrupt titan named Necross who wants the Sun for himself and placing the balance of night and day in great peril. Now with the help of a wax-child named Glim and the warrior, Sohone who also became the Sun Guardian, they go out on an exciting journey to get the Sun back and restore the Moon to their rightful place in the sky." In an imaginary world, a small Sun and Moon were made by the first Guardians to warm up a small planet inhabited by different marvelous people. The first Guardian of the Sun harpooned a star to keep it close to the planet, and hung it by chains to a mobile temple that is like a huge quadruped animal made of rock. The first Guardian of the Moon descended into the world of dreams and carved the Moon in a quarry of oneiric stones, and threw it into the sky. Since then, the Guardians follow generation after generation and preserve the harmony of the world. The people of the day and those of the night live in relative harmony, even though they are very different from each other. But in the depth of the planet, Necross awaits the opportunity to set darkness over the world. The day is approaching when Sohone, the apprentice of Xolal, Guardian of the Sun and Leeyoon, the apprentice of the Guardian of the Moon will take over from their respective predecessors who are too old to carry out their tasks. On the day of their introduction, a young girl named Glim, who lives with her father at the border of day and night, comes to watch the introduction ceremony among the crowd. The light of the Sun accepts Sohone as planned, and he proudly parades in front of the girls. Leeyoon however is avoided by the lunar ewe that is responsible for choosing the Guardians. The ewe choses Mune instead, a carefree and shy little faun who is good at soothing people's dreams. On the following night an upset Leeyoon is visited by pale snakes who stir up his jealousy and advise him to pit Sohone against Mune. Meanwhile, Mune has troubles maneuvering the temple of the Moon correctly: the temple leaves its path and interferes with Sohone. But while Sohone leaves his temple to scold Mune, Necross sends his two imps to steal the Sun and bring it to him. Necross makes the Sun die off gradually. Night falls everywhere, plunging everyone into fear. A distressed Mune is banished from his own people, but he promises to fix his mistake. Sohone is not in a good place either, because it was his own absence that allowed the imps to steal the Sun. They both set out on a quest to find the vanished Sun, accompanied by Glim. The latter is the most fragile of the three (her body of wax congeals when it gets too cold and is in danger of melting when it is too hot) but she is also the most educated, because she knows astronomy and has read the ancient stories of the world. Thanks to her, the group is able to pass the Great Blue Hole, a lake under which the great abyss opens that leads to the depths of the world. Glim is afraid that she will freeze and break in the cold water, but Mune comforts her and watches over her statue during the dive. After a few frights with an octopus, the group meets Phospho, an old Guardian of the Moon. He wakes Glim up and leads them to the entrance of the world of darkness, where Necross lives. Phospho tells them is story: Necross is an old Guardian of the Sun who attempted to keep the Sun for himself and who was hurled to the bottom of the world by Xolal, the predecessor of Sohone. But Phoshop gets angry and leaves them when Glim sheds light on his lies about his true role in the story for the world: Phospho, not as brave as he claimed, cowardly hid himself when Necross tried to capture the Sun. Meanwhile, Leeyoon takes Mune's place in the temple of the Moon, but he can't control the temple. Under his watch, the Moon wanes and crumbles into dust. Deprived of its star, the temple goes mad and starts galloping everywhere. It ends up arriving in the underworld where Mune, Sohone, and Glim are. 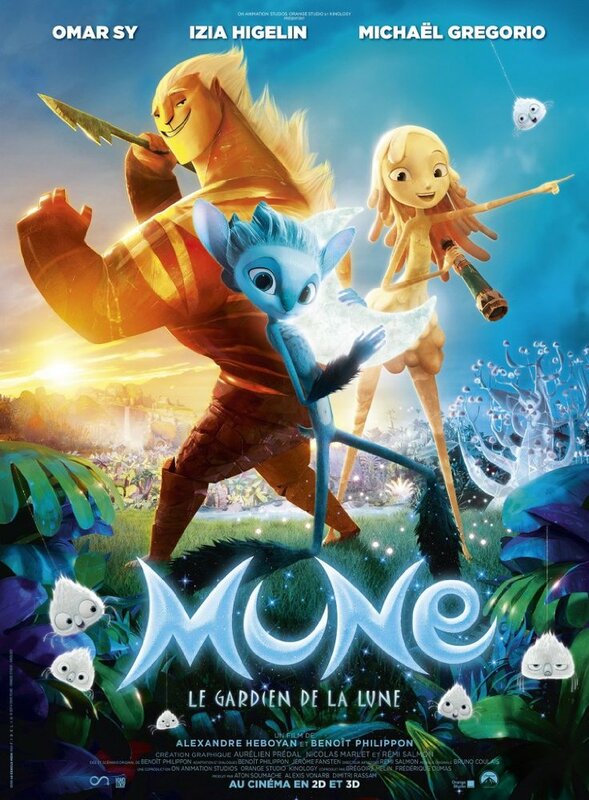 Mune, accompanied by Glim, takes care of the Moon while Sohone dives into the world of darkness to recover the Sun. Mune figures out that he can calm the temple of the Moon by using his sandman powers. Then, Leeyoon admits to him that the Moon is lost, but Mune decides to descend into the world of dreams to carve a new one. In the world of dreams, Mune and Glim are confronted by nightmares, Mune however dispels them with his powers. The two find the moon quarry and Mune carves a new crescent. Mune and Glim grow closer to each other and they realise they are in love, but they must launch the new Moon. With this task done, Mune and Glim rejoin Sohone in the world of darkness. During this time, Sohone is surrounded by a mass of pale snakes who make fun of him and try to make him go mad with hatred, as Necross had done in the past. Sohone is saved by Phospho's intervention, who sacrifices himself to calm and free Sohone. Sohone, Mune and Glim then confront Necross and his imps. Sohone is going strongly against Necross, who he doesn't manage to weaken. Mune finally gets rid of one of the imps. Glim is not threatened by the other imp, called Spleen, who doesn't want to do evil and prefers to discuss gardening with her. Glim finds the Sun and blows on it to revive its fire, but that causes her to melt. Mune finally comes up with a way to defeat Necross: he sends him to sleep with his powers. In the world of dreams, Mune realises that Necross is influenced by a pale snake, which he then pulls out and crushes. Necross regains his Guardian of the Sun appearance he had before getting corrupted by envy. Upon awakening, Mune finds that the world is now peaceful. The two young Guardians can resume the normal trajectories of their temples. However, Mune is saddened by Glim's death. He resculpts her and gives her a fragment of the Moon, but she doesn't revive so he leaves in tears. To his joy, the combined energy of the Sun and the Moon at daybreak allows Glim to wake up. Mune and Glim meet up and kiss each other before going around the world on the temple of the Moon.